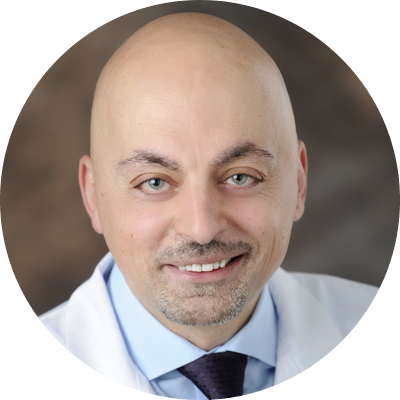 Ayman Koteish, MD, joined the AdventHealth Transplant Institute, formerly Florida Hospital Transplant Institute, in the summer of 2014 as the director of Hepatology and the medical director of Liver Transplant Services. He most recently served as an assistant professor of medicine at the Johns Hopkins University School of Medicine, Baltimore, Maryland, was the director of the Liver Transplant Fellowship Program and the medical director of Live Donor Liver Transplantation. He has extensive research and publication experience in liver disease. Dr. Koteish received his bachelor's degree in Biology as well as his medical degree from the American University of Beirut. He completed both a gastroenterology fellowship and a transplant hepatology fellowship at Johns Hopkins University. Most recently, he also completed a Masters of Education in Health Professions through the John Hopkins University School of Education. Board-certified in Internal Medicine, Gastroenterology and Transplant Hepatology.